Our work habits are producing an increase in work-related injuries and stress. Computer use, poor ergonomics and extended sitting contribute to painful neck, shoulder and back tension, as well as repetitive stress conditions such as Carpal Tunnel Syndrome. 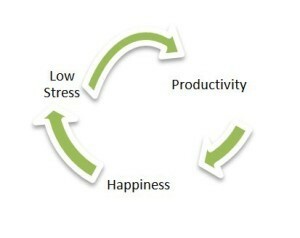 This leads to a loss of productivity, increased absenteeism, and higher healthcare costs. Workplace massage reduces stress and improves performance. It is becoming mainstream as companies recognize its therapeutic benefits, logistical feasibility, and positive impact on their bottom line. When employees feel less stressed, they take less sick days, are more productive, and show an increase in job satisfaction. As a result, business output increases, turnover decreases, morale improves, and healthcare expenditures are reduced. When massage becomes an important part of a comprehensive workplace wellness program, everyone benefits. If you believe your company may be interested in offering workplace massage please let us know. Once service is established, we will thank you with a 1-hr massage gift card to use at any of our clinics.